The NOAA Office for Coastal Management is accepting applications for the Digital Coast Fellowship. Three fellowship opportunities will be available in 2016. This two-year opportunity starts in August 2016, and offers a competitive salary, medical benefits, and travel and relocation expense reimbursement. This program’s mission, modeled after the Coastal Management fellowship, is to provide on-the-job education and training opportunities in coastal resource management and policy for postgraduate students and to provide project assistance to Digital Coast Partnership organizations. Photo by Fish and Wildlife Service Northeast Region. Our annual twilight walk of discovery at Horseshoe Cove on Sandy Hook will be held again in 2016. There are two available sessions: Friday, June 17th from 6:00 – 8:00 pm; and Saturday, June 18th from 6:00 – 8:00 pm. 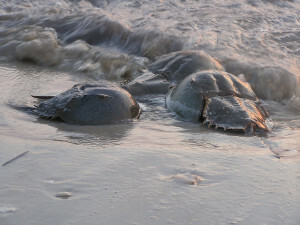 With a warm high tide, and a full moon, it’s the perfect time to see horseshoe crabs on the beach. We will learn about this amazing living fossil through hands-on exploration, crafts, a PowerPoint lecture, touch tanks, and other activities in our laboratory classroom. This event is open to individuals, families and groups including scout troops. Attention Scouts: New Spring Dates for Individual Boy Scouts Programs! You can now register for two Boy Scout Individual Enrollment classes: Oceanography and Environmental Science. We offer these classes once in the fall and once in the spring. It is for individual scouts (not whole troops) who wish to study Oceanography or Environmental Science. New Jersey Sea Grant Consortium’s Dr. Michael Schwebel will present at the coastal resiliency symposium “Strengthening the Jersey Shore” on March 29. The symposium is co-organized by the Monmouth-Ocean Development Council and Mott MacDonald. It will be hosted by New Jersey Natural Gas at their headquarters in Wall, N.J.
Additional presentations will cover topics including the COP21 climate change summit, adaptation initiatives in the U.S., sea level rise in New Jersey, and preparing for economic and infrastructure disruptions. The symposium will be held from 8 a.m. to 11:15 a.m. at New Jersey Natural Gas, 1415 Wyckoff Road. Find additional details and registration information here. Global sea level rose faster in the 20th century than in any of the 27 previous centuries, according to a Rutgers University-led study published today. Moreover, without global warming, global sea level would have risen by less than half the observed 20th century increase and might even have fallen. Instead, global sea level rose by about 14 centimeters, or 5.5 inches, from 1900 to 2000. That’s a substantial increase, especially for vulnerable, low-lying coastal areas. Will you be using Amazon this holiday season? If so, please consider using AmazonSmile for your purchases. When you select the consortium as your charity, Amazon will donate a portion of the amount you spend to us. Using AmazonSmile is exactly like using regular Amazon. To begin shopping, just go to smile.amazon.com and type in New Jersey Sea Grant Consortium as your charity of choice. Thank you for your consideration of this request and happy shopping! Dr. Michael Schwebel will serve among a select group of expert panelists in “The Shore’s Future: Living with Storms and Sea Level Rise,” a two-day conference sponsored by the Institute on Science for Global Policy from Nov. 20-21 in Toms River. Dr. Schwebel is the community resilience and climate adaptation specialist for New Jersey Sea Grant Consortium and Monmouth University’s Urban Coast Institute. “The Shore’s Future” will utilize a debate-and-caucus format pioneered by the ISGP. 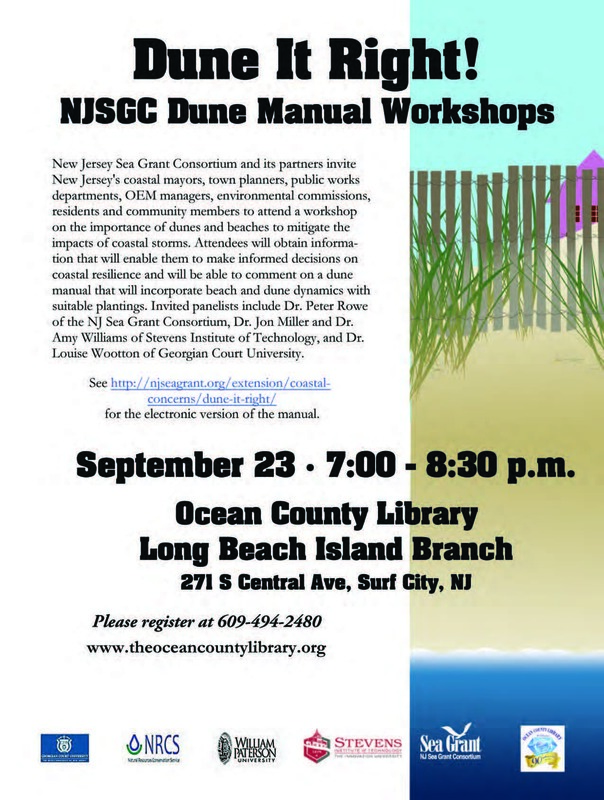 New Jersey Sea Grant Consortium and North Atlantic Regional Team, or NART, will host an ocean and coastal acidification workshop August 11 for stakeholders in the Garden State. This event is hosted by Stockton University, and is supported by NOAA James J. Howard Marine Sciences Laboratory, Rutgers’ Haskin Shellfish Research Laboratory and Aquaculture Innovation Center, and Delaware Sea Grant. Who: Peter Rowe of the New Jersey Sea Grant Consortium, which is sponsoring the event; Wei Jun Cai of the University of Delaware; Beth Phelan of the National Marine Fisheries Service, Sandy Hook Lab, NJ; Judy Weis of Rutgers University; Daniel Cohen and Peter Hughes of Atlantic Capes Fisheries; Interim Dean Peter Straub of Stockton University’s School of Natural Sciences and Mathematics. What: Ocean and Coastal Acidification Workshop – an opportunity to hear more about ongoing research into the impact of ocean acidification, which has hit West Coast fisheries hard and could become a threat to New Jersey’s industry. Shellfish harvesting in New Jersey has grown from $98.65 million in 2003 to $159 million in 2012, according to NOAA figures. Commercial fishing in general employed more than 50,000 people in 2012, and was worth $2.87 billion across all sectors. Oceans become more acidic as the water absorbs more and more carbon dioxide, which strips the oceans of carbonate, a key shell-building nutrient. “Research on ocean acidification and shellfish is just beginning here in New Jersey, and there are no indications of a serious problem at this time,” said Lisa Calvo, the New Jersey Sea Grant aquaculture specialist. “The question of how OA affects these industries is something that the workshop is meant to address,” along with environmental impacts. When: Tuesday, Aug. 11 from 11 a.m. – 4 p.m. Detailed agenda attached. Where: The Board of Trustees Conference Room, Campus Center, Stockton University, 101 Vera King Farris Drive, Galloway, N.J.
Multimedia: The event will have photography and video opportunities. Media Access: For information, wi-fi accounts or other help on the day of the event, please call Maryjane Briant at 609-652-4593 or 609-335-3859. The purpose of this workshop is for stakeholders — fishing, aquaculture, water quality and marine resources management and other non-governmental organization officials — to become better informed about ocean acidification. Scientists and officials want to learn from the stakeholders so they can develop an implementation plan for addressing ocean and coastal acidification in the Northeast. To review the agenda, click here. Get 20 facts about ocean acidification, click here. The day will include an overview presentation on the state of the science of ocean and coastal acidification, presentations from local industry representatives, and breakout sessions to hear more about changes you are seeing on the water, and on what issues and problems scientists and officials should focus their attention in the near future. The cold and snow of the past winter had little impact on the state’s beaches. Thanks to realtively few coastal storms, typical waves and minor flooding, the beaches and dunes were not punished by eroision. Two years of mild winters has lead to most of the more than 14 million cubic yards of sand washed away by Superstorm Sandy to be replaced by natural processes. The natural replacement of sand has been bolstered by Army Corps of Engineers beach renourishment projects. Commissioner Bob Martin, of the state Department of Environmental Protection, which is a NJSGC-member organization, spoke about the state’s efforts in conjunction with the federal government to rebuild Sandy-damaged beaches throughout the state, the water quality at those beaches and the low number of days in which beaches needed to be closed last summer. Click here to read an NJDEP statement about commissioner Martin’s remarks.